Their opinions were presented at the third edition of Vision China, a series of talks organized by the newspaper, at the Gallagher Convention Center in Johannesburg, days ahead of the BRICS summit in the city. President Xi Jinping will attend the summit to elaborate on China's stances in safeguarding globalization and open economies while strengthening BRICS cooperation, the Foreign Ministry said. Wang Xiaohui, executive deputy head of the Publicity Department of the Central Committee of the Communist Party of China and director of the State Film Administration, addressed Tuesday's event, saying that built upon the amazing achievements in previous years, the BRICS has become a model of cooperation for emerging market economies and developing countries. Wang called it a source of positive energy for the international community. BRICS is a grouping comprised of Brazil, Russia, India, China and South Africa. "China has now entered a new era under the leadership of President Xi, during which China remains committed to people-centered development, it fully implements a vision of innovation, coordination, environmental sustainability and openness and it forges ahead toward the Chinese dream of national rejuvenation with firm determination," he said. Wang is leading a delegation in South Africa, attending several cultural and media events to warm up the BRICS summit, which showcases China's strong support of BRICS cooperation and its commitments in developing a relationship with South Africa and other African countries. Wang also said Vision China, focusing on BRICS and Globalization, will have profound implications and carries great vision, while reflecting on the in-depth consideration and responsibilities for future BRICS cooperation. 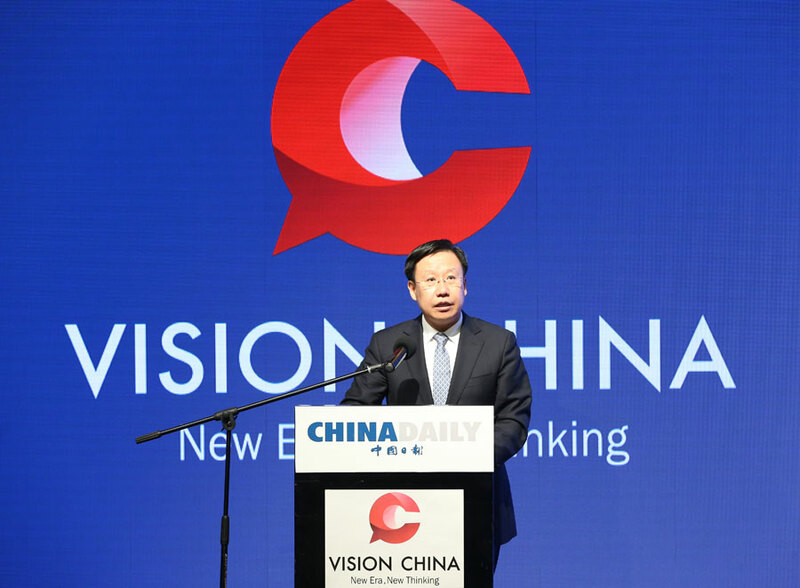 Zhou Shuchun, publisher and editor-in-chief of China Daily, said that as the national English newspaper in China, the paper will continue to tell real stories of China in the new era in a comprehensive and multifaceted way and play a role in bridging China and the world. China Daily will make greater contributions to enhancing the exchanges of humanities between China and the rest of the world while moving forward the building of a community of a shared future for mankind, Zhou added. "China in the new era will present new opportunities for world development and bring new and more opportunities for BRICS cooperation as well," he said. The event is a new venue for international communication. World-class experts from political, economic and academic fields were invited to speak — telling China's story, discussing global issues and spreading the country's voice. As guest speakers, Zhao Zhongxiu, vice-president of China Council for BRICS Think Tank Cooperation and also vice-president of the University of International Business and Economics in Beijing; Martyn Davies, managing director of emerging markets and Africa at Deloitte; and Andrew Moody, senior correspondent of China Daily's overseas editions, shared their thoughts about BRICS and Globalization with about 300 attendees, as well as online viewers. Zhao said in his speech that Xi's proposal of jointly building a community with a shared future for mankind provides a global vision of building a world of lasting peace, universal security, common prosperity, openness and inclusiveness — as well as a clean and beautiful environment. "China has actively pushed for the reform and development of a global governance system in a direction that is more conducive to developing countries," Zhao said. "In the meantime, China firmly opposes trade protectionism and consistently upholds multilateralism, promotes the Belt and Road Initiative, enhances partnerships among BRICS members and works to deepen China-Africa cooperation." He said that collaboration among BRICS countries is comprehensive and multifaceted, constituting an important approach of jointly building a community with a shared future. He said the second "golden decade" of BRICS cooperation is expected to be even more vibrant. Zhao also shared his own story of taking a train to Beijing while a boy from the countryside to attend a university decades ago. The trip took about 20 hours. But now, high-speed trains can link his hometown and Beijing much quicker than before. Citing the example of China's railway project in Kenya, Zhao said, "African countries have been benefiting from China's high-tech progress." He said China is willing to contribute more to African countries in boosting infrastructure and building common prosperity. Zhao cited an African saying to make his point: "If you want to go fast, walk alone; if you want to go far, walk together." "In face of unilateralism and protectionism," he said, "the BRICS countries need to walk together to deal with the challenges." Davies said he believes the most strategic play for BRICS is China's engagement with Africa, and Africa's engagement with China. "The engagement between the two sides truly is a partnership for mutual benefits," Davies said. "The challenges are how to scale the collaboration and the alignment of interests at the global level to counter the negative trend of protectionism and de-globalization, trends that undoubtedly will significantly impact the South African economy." Davies said he first thought that because the BRICS countries are scattered on different continents, it was hard to forge partnerships. But he said dealing with the recent development of isolationism, unilateralism and protectionism coming from Washington, those subjects will be a front for them to coordinate stances. "I am looking forward to seeing how the BRICS summit talks about these issues, what resolutions are put forward and how emerging markets can increasingly, in a more coherent fashion, start to respond to the challenges and the turbulence in today's global political economy," he said. Davies has also shown how China has become an economic growth engine driving development for different regions since the beginning of the century, citing an example that the rapid development in East Africa in recent years has come in tandem with China's economic growth. Moody shared with the audience how the China-Africa relationship appears from the perspective of a journalist. By telling the stories that he heard during interviews with academics and experts who have focused on the China-Africa relationship — as well as senior African politicians — Moody talked about how the China-Africa relationship fits in with the building of a community of a shared future for mankind. He said China's engagement with Africa is part of a much larger picture and he believes that Xi's view of globalization goes beyond just trade and economy — it underpins China-Africa relations overall as well as BRICS cooperation. By citing the example of Chinese companies' presence in Africa, he concluded that "the China-Africa relationship is a win-win cooperation, and China has made great contributions to the development of Africa." Thesele John Maseribane, minister of communication, science and technology of Lesotho; Andriamandavy VII Riana, minister of communication and relations with the institutions of Madagascar; and Riaan le Roux, chief operating officer of South Africa's Department of Trade and Investment, also addressed the event. Le Roux said his country will work with the international community and BRICS countries to bring down barriers and protect the multilateral trading system amid the fact that the world is faced with multifaceted challenges. It is expected that this will be the joint signal that BRICS countries will send at the upcoming summit, he said.